As mentioned in the previous post I started a handful of Echinocactus polycephalus (SNL 91; Las Vegas, Nevada) from seed a few weeks ago. 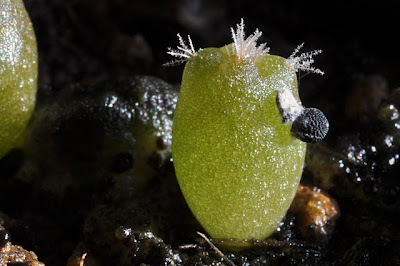 I didn't achieve impressive germination rates and many of the seedlings were killed off by mold while still enclosed in the humid atmosphere of the germination "tent" - and more have withered after I exposed the seedlings to the harsher environment outside of the plastic bag they germinated in. 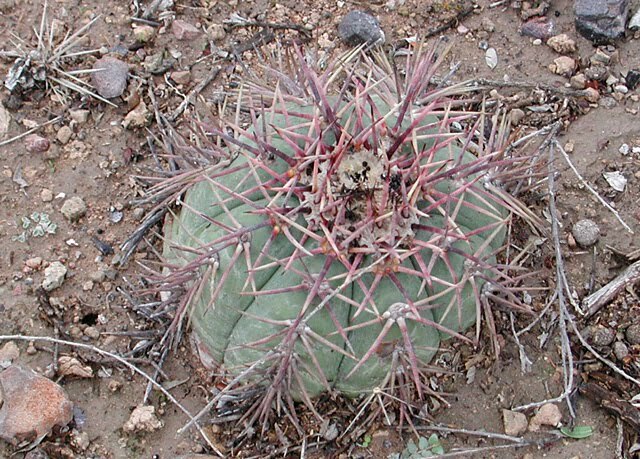 So for all practical purposes Echinocactus polycephalus (and E. horizonthalonius) live up to their reputation of being extremely difficult to grow from seed. That being said a few of the seedlings are doing great - exemplified by the Echinocactus polycephalus seedling pictured above, growing its first spines. 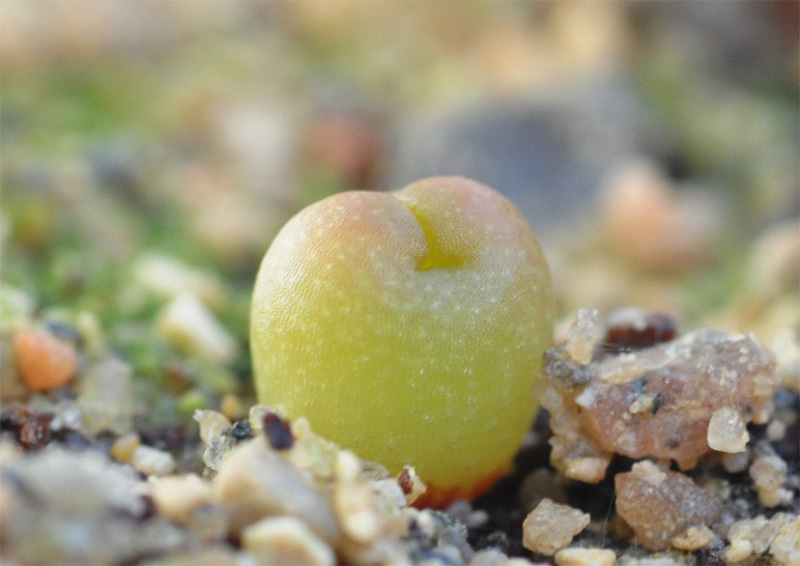 Interestingly one of the Echinocactus polycephalus seedlings turned out to be a tricotyledon. 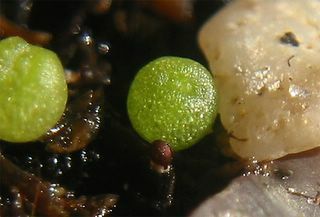 Members of the Cactus family belong to the group of dicotyledons, i.e. their seedlings have two cotyledons or embryonic leaves. 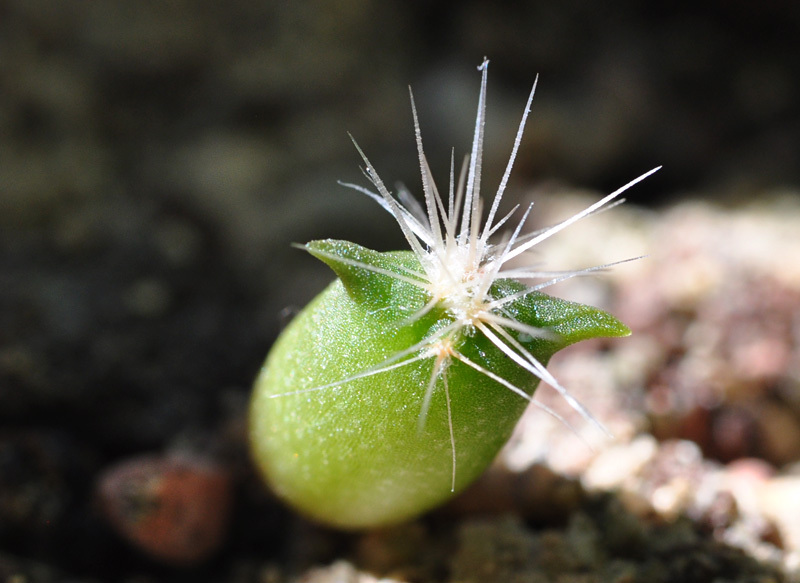 So evidently Echinocactus polycephalus is a dicot but for some reason this seedling decided to grow three seed leaves instead of the habitual two. 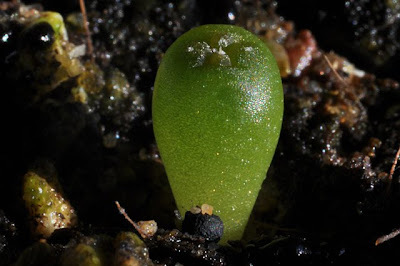 Polycotyledons could be considered freaks of nature or "mutant" plants but this seedling will probably grow up looking exactly like the other plants from the same batch. 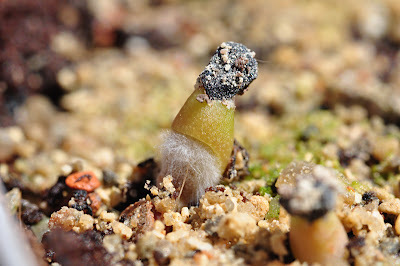 The last time I experienced a polycot seedling was some years ago when an Opuntia polyacantha var. 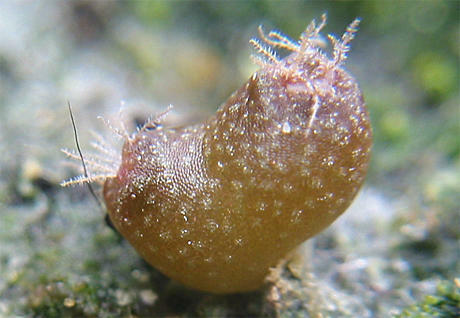 hystricina seedling germinated with three seed leaves. Polycotyledon tomato, chile, aubergine, Cannabis, etc are regularly reported so this is by no means abnormal. It would be interesting to know though if this is affecting the plants in any way (as mentioned, the last time I experienced a tricot seedling the plant grew up to be indistinguishable from the "normal" plants). 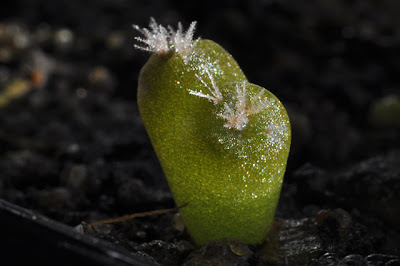 I'm also curious as to what is causing the extra seed leaves (the Opuntia seedling mentioned above was grown fresh from seed collected in the Grand Canyon; indicating to me that polycots are occurring naturally and are not (only) caused by "mutagens" in the environment). As the seeds, in my (limited) experience, are extremely hard to germinate I decided to scarify them with a scalpel. You have to be very careful not to damage the embryo when making shallow cuts in the testa (seed coat) with a scalpel - and manually scarifying 80-some tiny seeds is an extreme test of your patience. After brutally cleaving several seed embryos I settled for chipping away at the protrusion of the hilum - this allowed me to break of small pieces of the testa without damaging the embryo within. The scarified seeds were left to soak in water for a few hours - I added the smallest tad of detergent to remove the water surface tension and allow for more efficient soaking of the seeds. A few days after sowing the seeds several seedlings have surfaced. Unfortunately a few of them are already showing "rusty" spots and some has completely damped off, killed by mold. 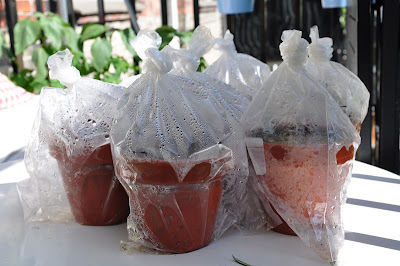 Consequently I'm quickly introducing the seedlings to a dryer environment and will soon remove them completely from the plastic bags they germinated in - I hope that the remaining seeds continue to germinate in spite of the harsher environment. Steve Brack's encouraging notes regarding this type of cacti reads: "rot easily, right after germination: not too wet, dry air and stronger light." Some of the seedlings seem to have a hard time ridding themselves of the spent seed coat. They grow slightly etiolated and don't develop much chlorophyl in the deep shade of the testa - consequently they turn all red when exposed to the sunlight. 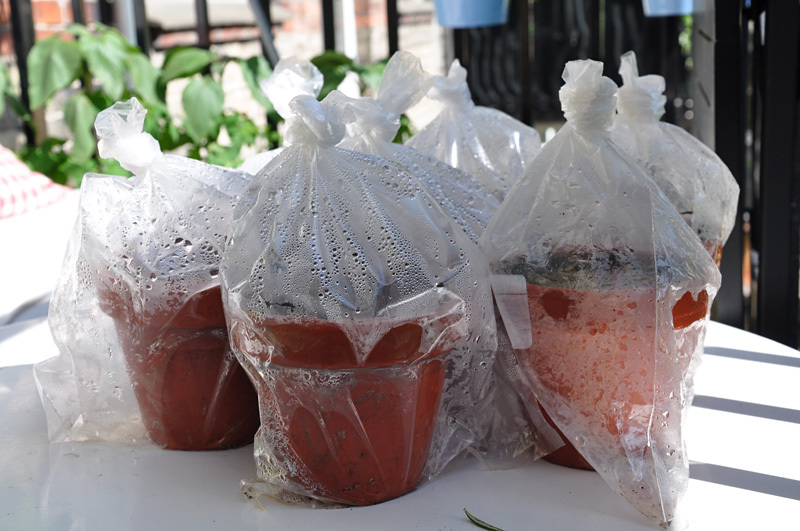 As usual I'm germinating my seeds in pots placed in clear plastic bags. As it's early summer I'm experimenting with germinating the seeds outdoors on the balcony - the daytime temperatures are around 20 C (68 F) with pleasantly cool nights. The temperature inside the bags off course grow hotter as they are exposed to sun during the day. 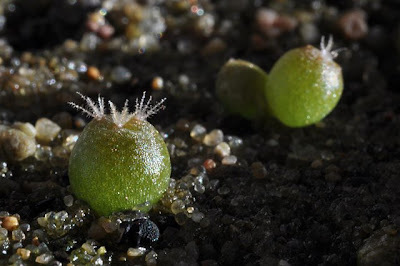 The Echinocactus horizonthalonius seedlings seem somewhat easier and more "well behaved". 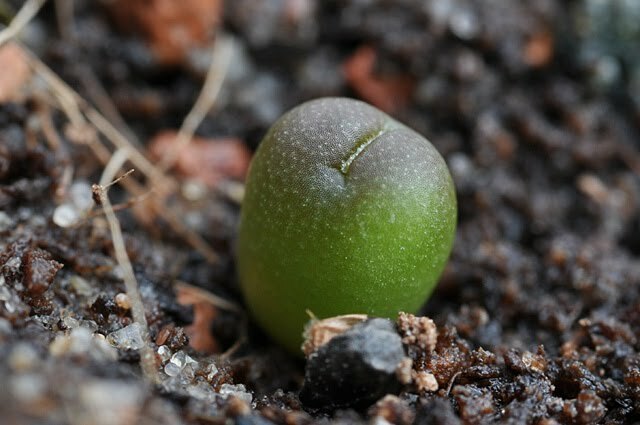 They have no apparent problems shedding the spent testa, and grow nice and flat; but quite a few of the seedlings have damped off. 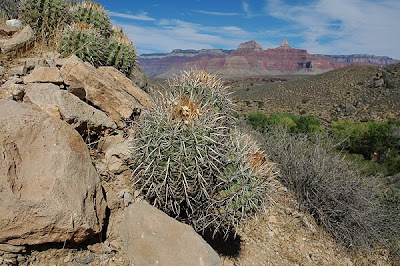 Late May I started 20 Echinocactus horizonthalonius seeds (SB 409; Shafter, Texas) and for several weeks nothing happened. But lately it has been extremely hot in Denmark and these weather conditions seem conducive to the germination of E. horizonthalonius. The above habitat photo is by Kauderwelsch and is licensed under the “Creative Commons Attribution-Share Alike” license. The original picture can be found at the Wikimedia Commons. 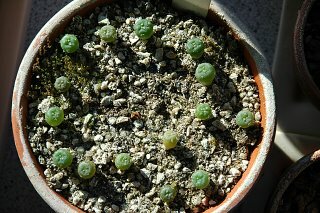 This spring I started my “virgin batch” of Lophophora alberto-vojtechii (San Luis Potosí) seeds. L. alberto-vojtechii is a recently recognized species that is not yet commonly cultivated, consequently the seeds are sold at rather steep prices – I bought my 10 seeds for 16 euro (~20 USD) from Köhres-Kakteen. 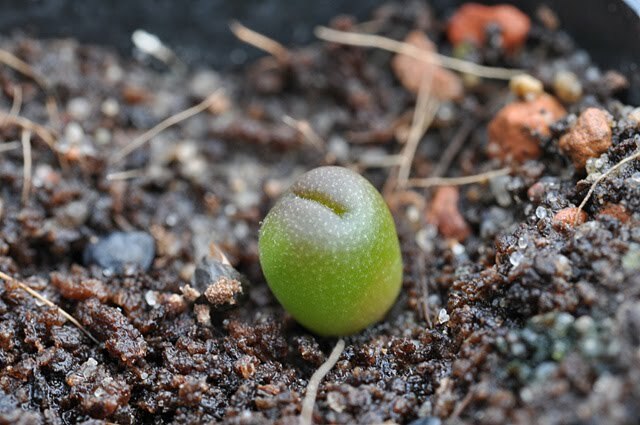 The seedling looks exactly like a regular peyote seedling except that it is lacking the tiny, plumose spines, but given the fact that I only have one seedling it’s too early to say if this is a general trait or not. As mentioned above the species was only recently described and there are some doubts if it’s a good species or not - it’s going to be interesting to see more plants appear in cultivation. That being said, several authorities are vouching for Lophophora alberto-vojtechii as the fifth species of Lophophora: George Hinton collected the type specimen (and keeps it in the G. B. Hinton herbarium filed under number 28642) and in a recent presentation on Lophophora population genetics Martin Terry also treats L. alberto-vojtechii separately from the other species. 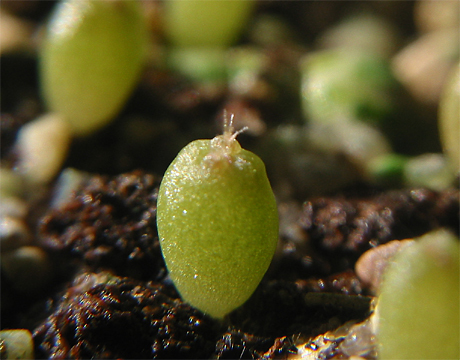 The plant was started from seed April 5, 2010 and the pictures were taken June 14, 2010 – exactly 10 weeks later (approximately two months after the lone seed had germinated). Expecting more seedlings to have germinated, I had planned to graft some of them but now I’m having second thoughts, not wanting to risk my sole L. alberto-vojtechii seedling. 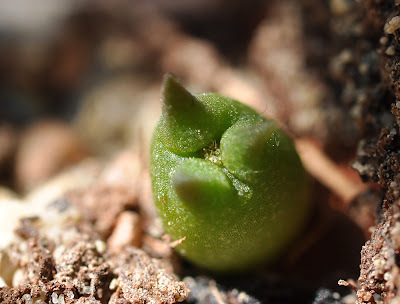 After this winter’s freezing disaster I’m glad I decided to order seeds of the northernmost form of peyote as this “strain” (a.k.a. 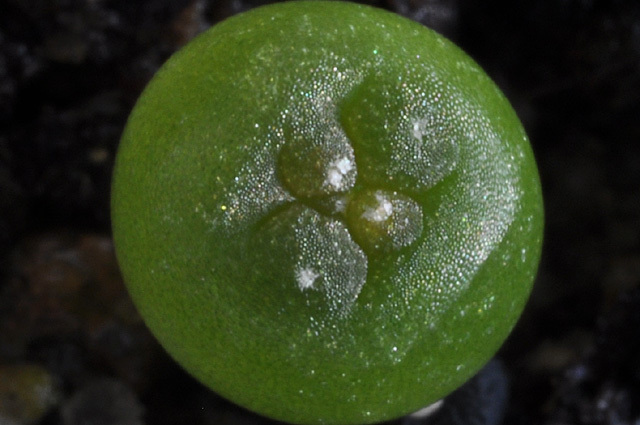 Lophophora williamsii var. 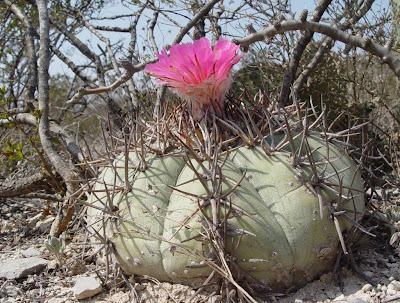 echinata) is known to be more frost tolerant than other varieties of peyote. For growing in my coldhouse I ordered Lophophora williamsii v Big Bend, Texas and Lophophora williamsii v Camargo, Chihuahua seeds from Köhres’s list – I’m not entirely sure if the Camargo variety classifies as echinata but it originates from the western extremity of peyote’s range, pretty far to the north, so I expect it to be able to “rough it out” in my unheated greenhouse. 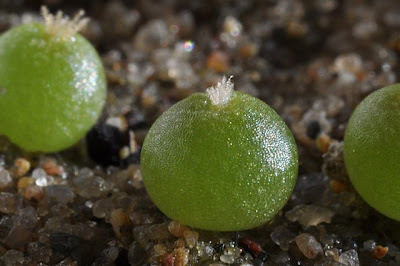 The small, feathery spines are typical for Lophophora williamsii seedlings – according to Boke and Anderson seedling tubercles bear three to six plumose spines, numbers that correspond well with what I observe in my seedlings (the odd areole having seven spines). With age these spines are gone, replaced by tufts of trichomes. 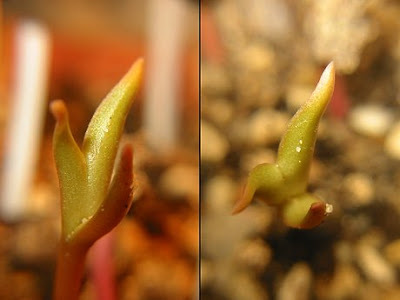 The plants pictured above were started from seed April 5, 2010 and the pictures were taken June 14, 2010 – exactly 10 weeks later (approximately two months after most of the seed had germinated). 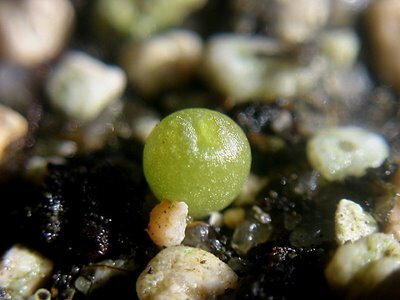 One month ago I sowed most of my Lophophora seed for this season and thought I would post some pictures of the minuscule seedlings, only a couple of weeks old. 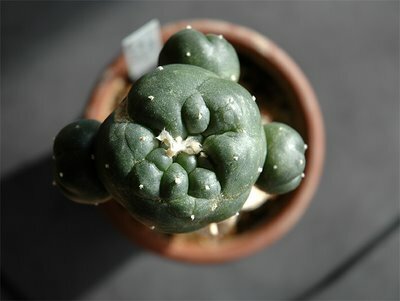 I again bought seeds originating from the L. williamsii population in El Oso, Coahuila as I'm fascinated with the plants described in the booklet The genus Lophophora – Kaktusy Special 2, 2005 - allegedly this variety forms massive clusters with individual heads measuring up to 15 cm in diameter. 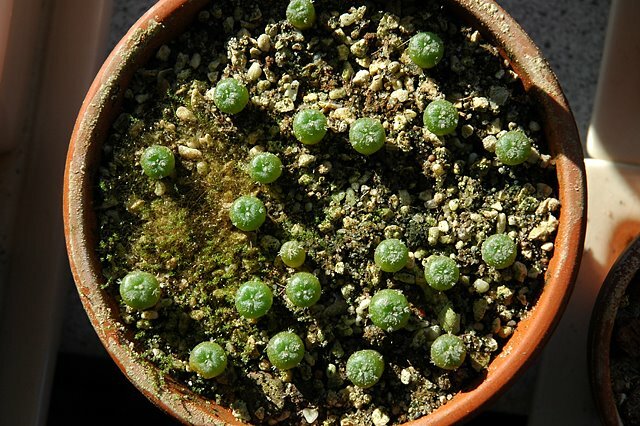 The two seedlings in the center front of the above photo have grown from the same seed. I'm growing increasingly enchanted with Lophophora fricii but don't really have any mature specimens of this interesting species (except one plant that is almost of flowering size). 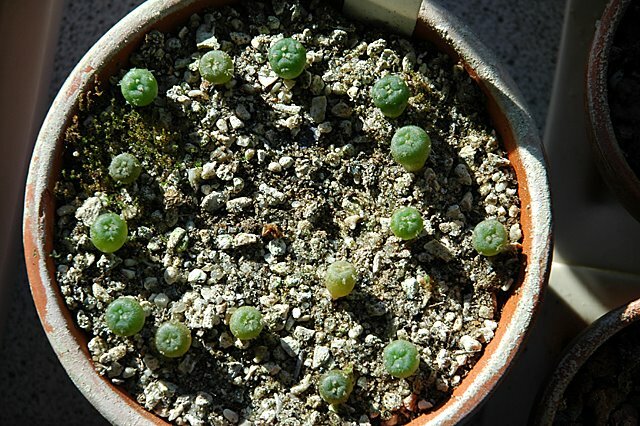 To amend this I'm starting batches of Lophophora fricii from seed on a regular basis. The L. williamsii plants from Presidio County, Texas represent the northernmost form of L. williamsii, also known as Lophophora williamsii var. echinata, and is a self-evident candidate for growing in the coldhouse. 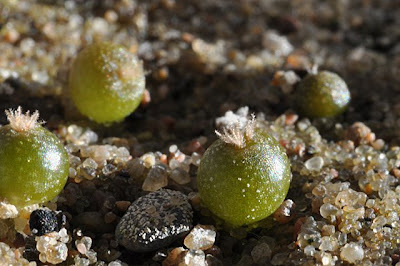 It’s time to shake off the dust of the prehistoric peyote buttons from the previous post and get started with the new growing season. Two years ago today I grafted a 50some days old Lophophora williamsii (SB 854; Starr Co, Tx) seedling onto a (then extravagantly oversized) Trichocereus pachanoi stock. The plant has set 3 offshoots and grown to a width of 5.6 cm (~ 2.2'' – excluding the offshoots) and a height of 4.8 cm (~ 1.9''). It’s currently busy increasing the number of ribs from 5 to 8 (or maybe it goes directly for 13 ribs... it’s a bit hard to tell at this stage). 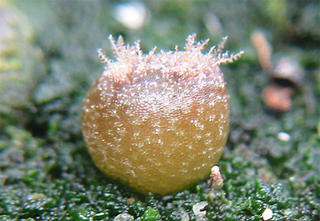 For comparison you can check this photo of the same graft one year ago. The plant flowered 4 times last year – all flowers were self-pollinated. The resulting fruits contained 22 seeds that were sown April 4, but until now only 5 have germinated and out of these only 3 seedlings are thriving. Yet another illustration of why inbreeding should be avoided. I find it quite amazing that grafting enables you to go full circle from seedling to seedling in two years. 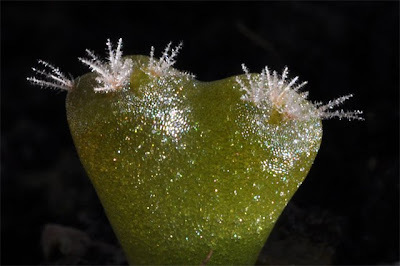 A more detailed account of the plant’s flowering and fruit setting can be had by following the “previous” links. 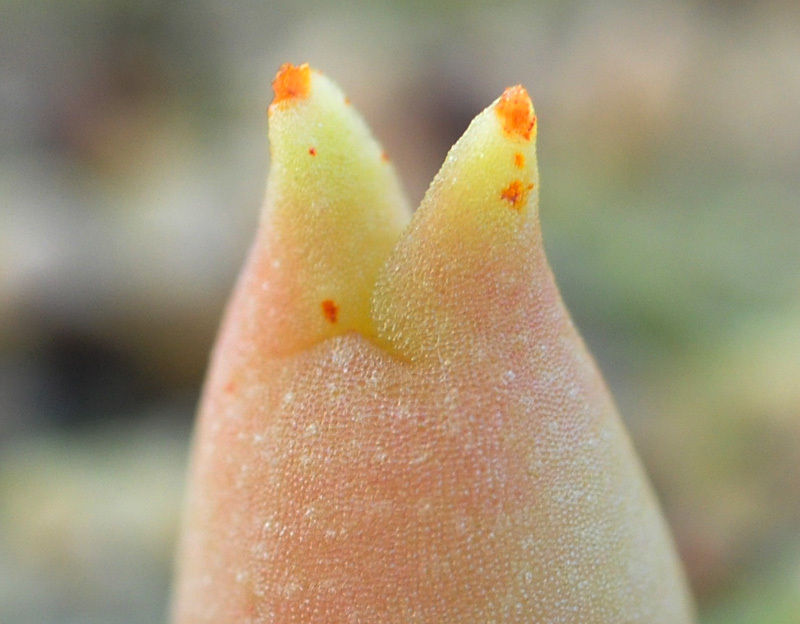 Allegedly O. denegrii v. prerovskyana has smaller tubercles than the typical form of the species and long cream/pink flowers - I'll find out for sure in 10 years time ;-). The seeds were bought at Kaktusy Ryšavý and sown in a mix consisting of equal parts of limestone gravel, loamy sand, and regular soil. Last years crop As described on the Growing cacti from seed page I'm sowing my seeds in pots placed in plastic bags. Usually the pots are removed from the bags after some weeks but last years Lophophora seedlings have spent a full year secluded in the bags! 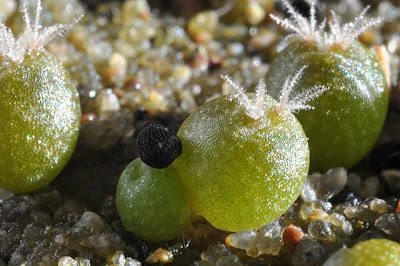 Lophophora williamsii seedlings (RS 428A; Cuatro Ciénegas, Coahuila) It's amazing that cactus seedlings can thrive for a year in the humid environment of a sowing bag (notice the green stuff among the seedlings - it's moss! ), but it seems to become them well. 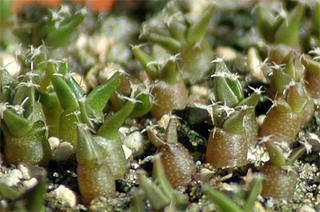 Lophophora diffusa seedlings (RS 1193; Peña Miller, Queretaro) The benefits of growing in bags are many, e.g. you don't need to water often and most pests like red spider mites are avoided (on the other hand you have to be careful not to let in sciarid flies). On the downside, the plants seem slightly leggy - probably because they haven't been fully dormant throughout winter. 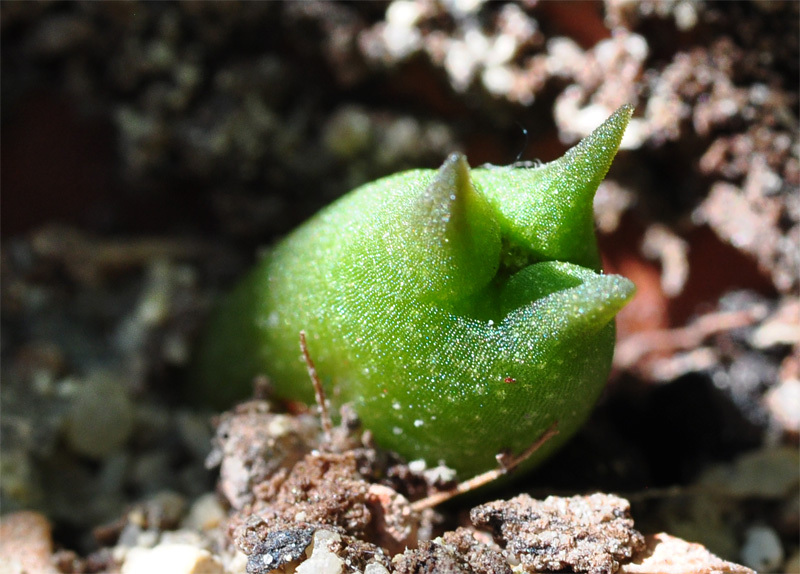 Until lately my Strombocactus disciformis ssp. esperanzae seedlings were thriving and slowly growing in the safe and secluded environment of a plastic bag. Recently I checked the plants and found dried husks and seedlings without roots. When I opened the bag a couple of sciarid flies soared out. The soil was sterilized before use so I expect the flies must have entered one of the times I aired the bag. 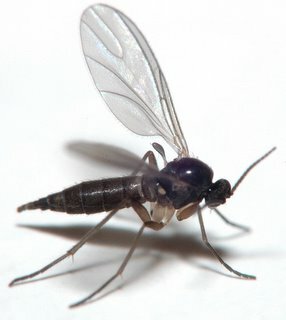 Sciarid flies as such are not dangerous to the plant but their larvae will feed on root hairs, enter the roots or even attack the crown or stem of the plant. In the future I’ll take heed when airing my seedling bags and avoid organic material in the soil (the larvae of most species are scavengers, primarily feeding on decaying organic matter). 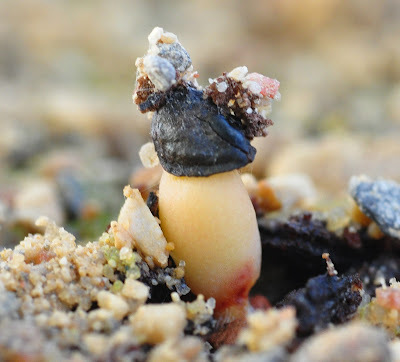 Today only one seedling is still alive and it is not doing well – the few seedlings surviving the attack also had to cope with the abrupt introduction to the harsh environment outside the bag (the soil had to dry out completely to kill off any remaining larvae). 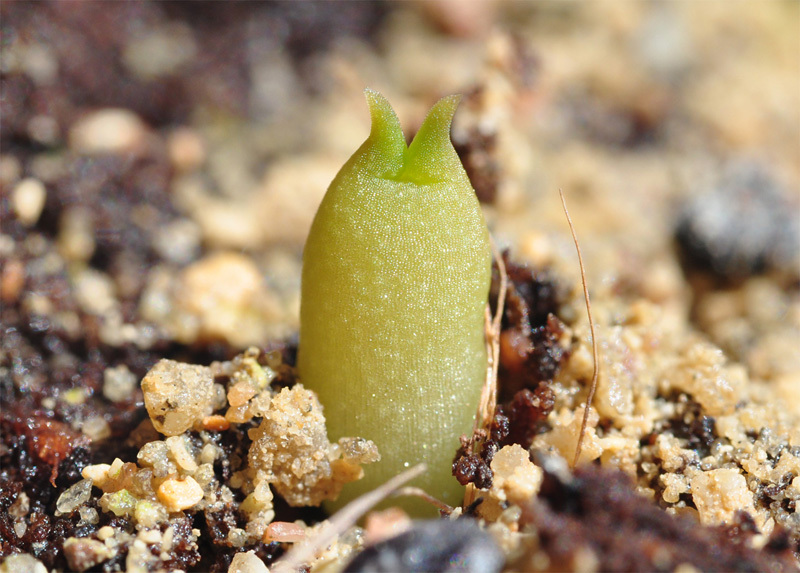 The 6 Ariocarpus fissuratus (PP 176; Big Bend, Texas) seedlings also started out convincingly but after growing a couple of diminutive tubercles each, their growth grinded to a halt. 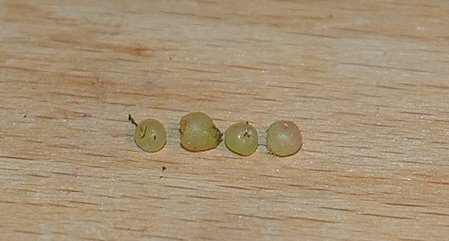 I’m a bit disappointed with the germination rate of these A. fissuratus seeds and will probably try again next year with seeds from a different supplier. I’m not sure if it’s the seed, the coldhouse environment or sheer coincidence, but in addition to the deviating growth forms described in an earlier post one of the Lophophora williamsii (SB 854; Starr Co, Texas) seedlings turned out achlorophyllous. 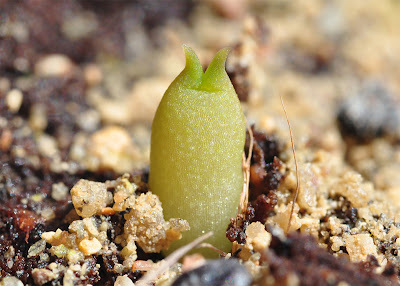 The seedling lacks chlorophyll and will not survive on its own roots for long so I grafted it on Pereskiopsis spathulata – hopefully it will survive and prosper. Some of the Lophophora williamsii (RS 268; Huizache, San Luis Potosí) seedlings are developing interesting growth forms. 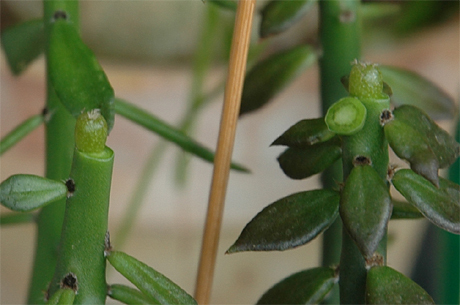 One is clearly dichotomous (a simple type of branching in plants where the apical meristem splits at various intervals) and another shows signs of an extension of the apical meristem into a ridge - I'll watch it closely to see if it develops a crest. 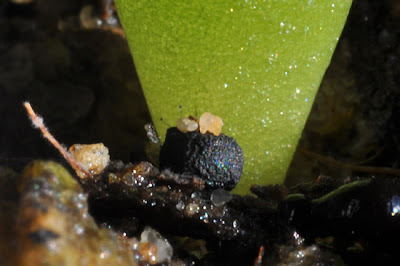 Lophophora williamsii seedling with a crest meristem? Two weeks ago I rooted 4 Pereskiopsis spathulata cuttings and they are now in full growth. 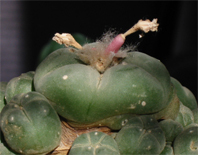 I’ve grafted 4 plants from this year’s batch of Lophophora seedlings on the Pereskiopsis plants – 2 seedlings each of L. williamsii (RS 428A; Cuatro Ciénegas, Coahuila) and L. diffusa (RS 1193; Peña Miller, Queretaro). The Living Rocks web site describes seedling grafting on Pereskiopsis in great detail. My Strombocactus disciformis ssp. 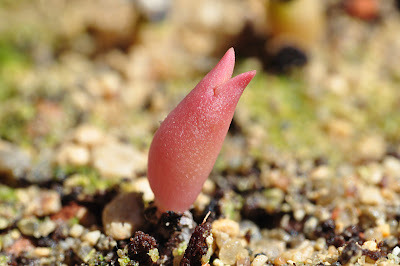 esperanzae (S. pulcherrimus) seedlings are enjoying the spring and bursting with growth. 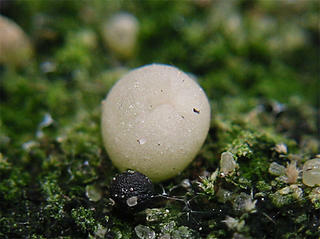 After two months they have reached a staggering size of 1 mm in diameter. The seedlings are still kept in a closed plastic bag in the window sill – apparently the bright, humid atmosphere is becoming them well. Approximately 40 out of 60 seeds germinated.